Chaga is a hardened, blackened, crusty formation that looks like a snout or nose coming out from the tree. Do not harvest Chaga smaller than a grapefruit size ( 5/lbs to 10/lbs). Leave these smaller ones to grow for a couple more years. Chaga has been called a “tree cancer” since it will eventually kill its host tree, however, it isn’t completely known whether it occurs to help prolong the trees life or if it is actually cancer to the tree. 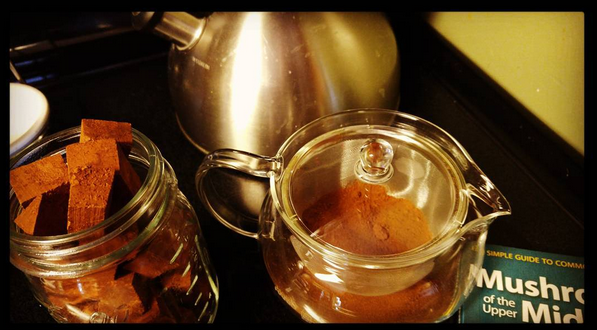 Chaga has attracted interest for centuries in fighting human cancer and other diseases. Leave some chaga on the tree to prevent damaging the tree. Do not harvest Chaga from a dead tree! If the tree is dead, the Chaga will be dead as well, and will have 0 medicinal values. Teas made from dead Chaga will be very bitter with a rather unpleasant taste. Estimates of Chaga parasitizing birch trees range from 1 in 20, to 1 in 15,000. Foresters have yet to do a thorough study of how widespread Chaga infection is in temperate forests. Chaga mycelium is inside many more trees than is obvious when the Chaga mushroom isn’t yet visible on the outside. Be sure you have done your research before you harvest chaga. Most trees that die soon after being harvested for Chaga is caused by the harvesters digging or chiseling into the tree to get all of the Chaga out, this practice results in further damage being done to the structure of the tree.